Thailand is a country that is generally hot and humid, with high temperatures throughout the year and lots of wetness in the air. 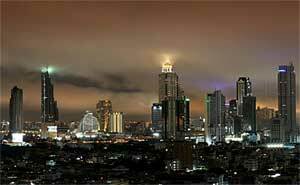 Bangkok, the capital city of Thailand, has similar temperatures and climate conditions. The weather in Bangkok, to put it simply, is tropical in nature, and the average temperature reflects the hot tropical climate regardless of the season. Speaking of seasons, there are two primary seasons that occur during the year in Bangkok. The first is the wet season, and the second is the dry season. The rainy season spans the May to September months, with exceptionally rainy weather around June. Although this season is known as the wet season, however, there will still be a lot of sunshine and the rain is often welcomed by the residents, as the temperature tends to stay in the high 20s without rain. The rain tends to fall in the afternoons, but naturally, the weather varies significantly, and on some days, the city will have nothing but rain from sunrise until sunset. The best time to visit the city is typically between the months of October and February, as during these times, the temperature will be between 25 and 28 degrees, which is more tolerable. There will be showers every now and then and the breezes will be light, and both of these elements combine to provide some measure of relief from the heat. The city is most dry between the months of November and February, which is part of why tourists are most likely to visit Bangkok during these months. The peak tourist season tends to occur at this time because the levels of rainfall are the least, and because the hottest weather of the year tends to come just after these months. Between March, April, and May, it is not at all unusual for the temperature to climb beyond 30 degrees Celsius and stay there for several days in a row. At the same time, the humidity levels are likely to be very high, which can make it feel like one is walking around in a sauna or a shower. Some people quickly become used to such temperatures, but others might need more time to adjust. People who visit the city during these months are advised to bring light clothing that is preferably made from cotton so they will be able to cope better with these sticky and hot weather conditions. 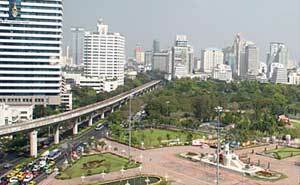 One of the things to be aware about with the city is that Bangkok sits only around 6 feet above the regional sea level. As a result, when there is a lot of rain over a lot of time, flooding can occur in several areas due to overflowing of the city's canals and rivers. Something went wrong at Yahho.